Two young American soldiers are trapped behind just an unsteady wall to shield them from an Iraqi Sniper. 'The Wall' is a deceptively simple, highly effective movie that will keep you at the edge of your seat for the entire running time. 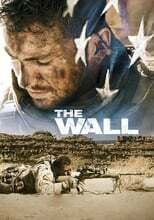 The Wall is directed by Doug Liman and was released on May 18th, 2017. Director Doug Liman's Thriller & War movie The Wall is produced by Big Indie Pictures & Amazon Studios & was released 2017-05-12.